Identifying lunar structures can present some difficulties due to different angles of illumination. This is especially so when the object is only partly visible at the terminator. The answer to the problem is found by considering two factors, a) position and b) its relationship to surrounding structures. Firstly, what is the position of the structure and to what lunar maria or other large structure is it near? Secondly, what is its relationship to other nearby known features? Using distance, direction, geometrical arrangement eg right angles, equilateral triangles or squares etc projected on to their positions help to place the object and confirmation can be made by noting special features such as central mountains, structural damage by craters, faults, differences in shade or shape and many other specific details. This confirmation is not possible on the dark side of the terminator but a consideration of the position and relationship of that sunlit crest or pinpoint of light can forecast what will be revealed in several hours or later the next night. As the most dramatic views are seen at the sunlit area recently passed by the terminator during the first fourteen days of the lunar cycle, following the terminator in its passage from new to full moon and from full to old is a good way to identify the lunar structures. During the last fourteen days the area west of the terminator gives the best viewing. Viewing limb structures depends on favourable libration in longitude and/or latitude and this will be noted where it is appropriate. Usually the material will be discussed under the headings of the Southern or Northern Hemisphere, but it is convenient to add a Central section to Day 2-3. The dividing line used between the two hemispheres is from the south edge of Mare Crisium to the north edge of Grimaldi, two easily identified structures. So let us follow the terminator in its passage across the moon, remembering that the structures vary their appearance at the same lunation in different months due to a number of factors and it may be necessary to consult the following material a day before or after the section selected. Unless you want to enter the Guinness Book of Records, to be the earliest observer of the new moon, or want to emulate the custom of the early Hebrews in observing the new moon to establish their lunar calendar, there is little of interest to be seen in the bright twilight. 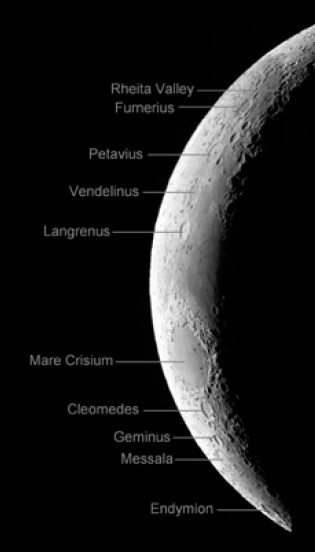 The largest structure seen is M. CRISIUM lying just north of the middle of the crescent moon. Its position may be closer (-ve longitude) or further away (+ve longitude) from the east (sunrise) edge of the moon. In the latter case, M. MARGINUS may be seen at the lunar edge close by. As the terminator creeps across M. Crisium’s floor on its westward march, the sea’s convex shape becomes obvious. A continental shelf next to the east and west walls and a central ridge running in a north-south direction can be seen. The early morning sun brightens the west rampart whilst the nearby floor of the sea is still dark. Two obvious small craters, PICARD and its northern neighbour PEIRCE lie on the western floor whilst an irregular ridge that resembles a flying bird is close to the western wall. Its southern part is the remaining wall of the crater YERKES. Further south, LICK, whose floor is convex, lies close to the wall. West of Yerkes at the edge of the wall are two prominent mountain ridges, PROM. LAVINIUM and the northern PROM. OLIVIUM, almost meeting each other. Incidentally, some time ago the media reported that a bridge was seen across these two points, but of course this was erroneous. The scalloped south coast of the sea is probably due to a lava flow destroying the seaward walls of coastal craters. If the terminator has crossed past the sea, the ramparts of TISSERAND and its larger western companion MACROBIUS, may be seen in the highland close to the north west corner of the sea. To the south west of M. Crisium’s southern end TARUNTIUS’ ramparts stand out in the darkness of the east indentation of M. FOECUNDITATIS. CONDORCET is the largest crater between M. CRISIUM and M. MARGINUS and its appearance may vary from a regular oval to a broad line, whilst to its south two small seas M. UNDARUM, a v-shaped cluster and its southern companion M. SPUMANS are accompanied by two dark-floored craters, FIRMICUS and APOLLONIUS respectively. Figure 1 : The Moon on Day 2-3 with pointers to some of the features mentioned. Figure 2 : The south-eastern corner of the Moon on Day 3 with pointers to some of the far southern hemisphere features. Image from the Consolidated Lunar Atlas maintained by the Lunar and Planetary Institute. A meridian line crossing the centre of M. Crisium also crosses a number of large distinctive walled plains to the south. Just over one north-south diameter of the sea south of its southern edge, the large LANGRENUS with two central mountains and terraced walls lies south east of a triplet of small almost touching craters at the east end of M. Foecunditatis. At the limb, lying between Langrenus and M.Crisium, the long thin looking M. SMYTHII may be found. At a diameter further south, PETAVIUS, another terraced walled plain with a fourpeaked mountain block, has a fault running from the mountain’s west to the southwest side of the crater. Although well seen in the lunar mornings, it soon loses its features as the days progress. WROTTESLEY, a small crater with a central mountain lies at its north west edge. Lying between the two large craters Langrenus and Petavius, VENDELINUS has its wall and floor damaged by many small craters. LOHSE, a small crater with a central mountain, invades its north west wall, the larger LAME invades its north east wall and HOLDEN, a small crater, lies at its open south end. In later days Vendelinus almost disappears. Still further south at the same distance as between Vendelinus and Petavius, FURNERIUS, another large walled plain has an obvious small deep craterlet in its floor, and several more around its walls. Slightly inland and lying between Petavius and Furnerius are two deep smaller craters forming another meridian chain with Wrottesley to the north. The southern STEVINUS has a much larger central mountain than its twin SNELLIUS, and at low illumination a ridge can be seen between Snellius and Wrottesley. Stevinus almost disappears as a ray system develops, hiding the crater in later lunar days. Transferring the distance between Petavius and Furnerius to the south west of Stevinus, the terminator may be crossing the southern end of the RHEITA valley running in a north west direction. It is a series of craters whose communicating walls have been destroyed and the crater after which it is named lies east of its northern end. Further south at a slightly lesser distance, the medium sized STEINHEIL invades WATT to form a figure eight, and may be partly illuminated. This structure is easily identified and is a useful guide to the surrounding areas. Slightly to the south and east, BIELA has a central mountain and a small crater on its north east wall and another crater touches its south wall. It begins a series of craters curving to the west, to be discussed later. Close to the limb between Watt and Biela, the dark thin sea M. AUSTRALE can be found. In the same meridian as Biela, HAGECIUS with several small craterlets in its south floor is invaded by a smaller northern crater, and has a footlike appearance. Following Crisium’s central meridian to the north, we find another series of craters slightly inland to this line. The closest and largest is CLEOMEDES whose walls and floors have been damaged by a number of craterlets and has two mountains in its floor. At its north west end TRALLES a small crater east of the elongated DEBES at its side, invades its wall. 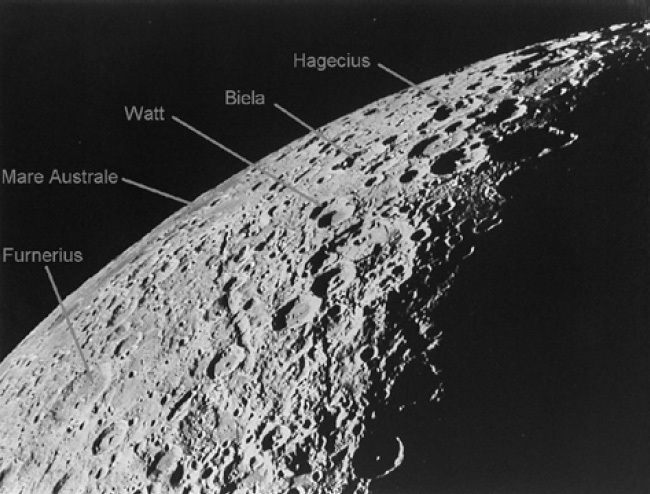 Close to its north the small crater BURKHARDT with its central mountain and cocker spaniel ears formed by elongated craters outside its walls separates Cleomedes from GEMINUS with its terraced walls and central mountain. A smaller crater BERNOUILLI lies at its east side. East of the two a large walled plain GAUSS lies at the limb, and if the libration is –ve (east) to an extreme degree it may project against the sky’s background. North and east of Geminus, the longer MESSALA another large walled plain with low walls and a floor strewn with boulders lies east of FRANKLIN a smaller deep oval crater near the terminator whose floor may be in darkness. North of Messala, LACUS SPEI is a dark patch lying between Messala and the smaller oval ZENO and its west companion MERCUEIUS. 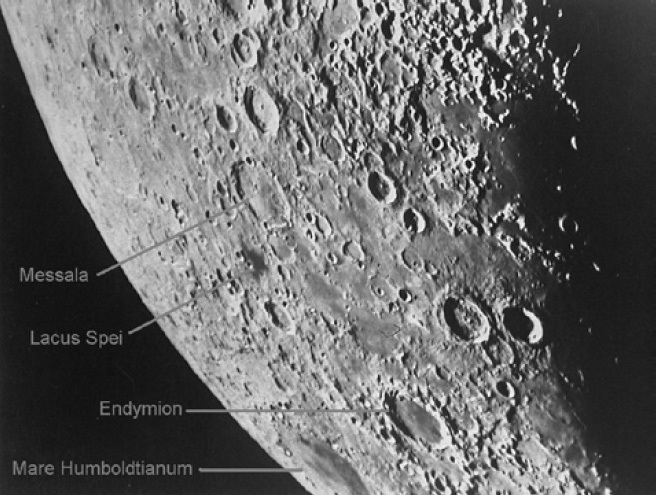 Transferring the distance between M. Crisium and this crater towards the north cusp of the moon, ENDYMION, an oval plain with a dark floor and high ramparts stands out and indicates the position of M. HUMBOLDTIANUM, a large sea at the limb that like Gauss may partly disappear around the edge of the moon. Closer to the north pole the elongated DE LA RUE with a battered floor and walls, has STRABO at its polar end and THALES touching its south west end. This latter crater will later develop a ray system. Figure 3 : The north-eastern corner of the Moon on Day 3 with pointers to some of the far northern hemisphere features.